I'm not very much of a graphics person. Who would like to make a few graphics for us? Bird's eye, to make it simple. Completely normal to the regional plane. How about making images a bit slanted from normal? 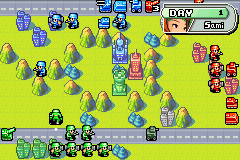 ie: in advance wars. (http://upload.wikimedia.org/wikipedia/en/1...dvance_Wars.png) Thus, it would be easier to identify objects (otherwise, a circle could be the top of a soldier's hat; all buildings would be squares, etc). Oh, that's what I meant. The units will have some perspective, but the map should not. I see, so it's not going to be like this http://courses.ulisesmejias.com/videogames...imCity+2000.jpg but rather just a flat 2-D map with seemingly 3-D objects that (however unrealistically) spring out of it? Yes. It's much easier to map coordinates to pixels this way and to make the graphics. Perhaps 3D maps we can iterate on after we get a working product. As you can tell, my primary goal is to get a usable product first and foremost. Otherwise, if the milestones are too far away, we won't get there before we lose interest. how about we do the models using 3d modeling programs, then just screenshot the jpegs or bitmaps in. I saw that done with a fighting game, back in the 90's, called "One Must Fall", and it was really cool. I agree we should have close milestones. But these gold mines and other things you stipulate... aren't some of them a little too specific or of your own personal idea to order to be implemented so early on without discussion? Authoritarianism is good, and we can't seem to as a group nail down what exactly we want on a map, so it's good that you're just picking likely things, but those are kind of assumptions that we'll be forced later down the road to implement whether we want or need them or not. Can you really differentiate cities from factories? Aren't factories in cities? Are we making cities as big as factories, so that each one of these things is really just another sort of trading/defense outputs with its own statistics? That's why there are topics for you to offer your input. I'm not running this as an authoritarian system. You're just not using your voice. We need a project leader. Not the 'brains' of the project, but the 'testicles' of it. I would be all for Jingy taking on a bit of authoritarian traits. It would assure that s*it gets done. The system doesn't work; I at least don't know what to talk about as there is a lack of understanding as to what the undertaking is. You did make up your own things for this section, so there you are. Not saying it's bad. It's good, because it creates definable things and eliminates stupid drawn on debate.